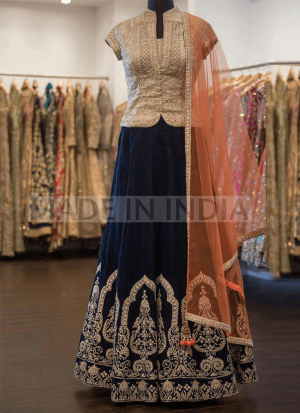 Zari,Beads,Tilla Nakshi, Dabka ,Cutdana Work Velvet Lehenga Choli And With Net Dupatta. Note: This is Made On Order Dress and needs to be fitted and stitched according to your size. If You Opt Stitching Option, Measurement chart will send to you via email after placing order.